Notice that I included my fellow human beings in this process. As an art professor I get asked a lot of questions. I love questions! My students, colleagues and friends will frequently ask me questions like this: “How can I earn money with my art skills?” “Is it possible?” “What if I am not going to be an art teacher, can I still find work as an artist?” “Where do I start on creating a freelance business with my design skills?” “What can I do with an MFA in art?” My intention is to help dispel limiting beliefs that finding work and earning money as an artist or graphic designer is difficult. In this book you will find the whole exercise and process that I have used to help answer some of these questions. 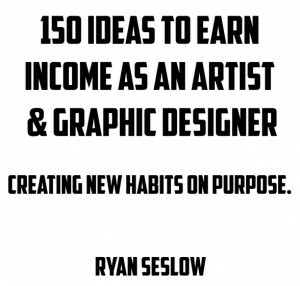 You can apply the 150 income generating ideas right away if they resonate with your skills and abilities. Or you can take on the bigger task of setting your own intentions to focus on. By taking on such a discipline, in 30 days you too can create a new habit that will help you see opportunities that are right in front of you. These will be ideas that you can take immediate action on. 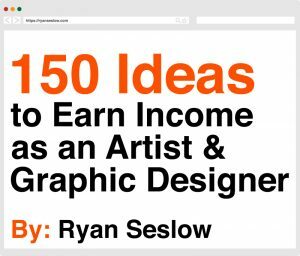 I have now generated 150 new income-generating ideas that I can apply into my freelance business. I will begin testing the ideas and sharing my experiences via this blog. I know that YOU can use many of these ideas. They will inspire you to set your own goals or intentions to install through the 30 day exercise. This technique can literally be applied to anything. I share much more on this in the book. It is important to know that we are capable of solving many our perceived problems and issues with a little discipline and a little planning. This book will suggest how you can do this. It helps when these motivations are fueled with positive emotions and excitement, as well as considering how we can help our fellow human beings at the same time. By making commitments to our self-discovery and personal development we will become more. I believe that this awareness helps the whole world. The world gets better when we get better. I am extremely excited to share this process with you all. Get the book here now!